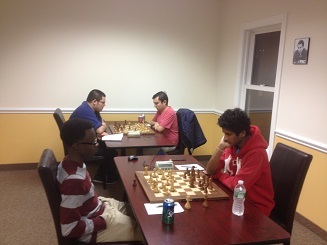 The weekly quads at CCFC continue to draw a nice range of competitors (1000 – 2400) along with super strong top quads. This time the average rating of quad one was over 2360! Top seeded FM Leif Pressman didn’t let a round one draw phase him as he won both remaining games to take clear first place! Meanwhile, Guy Colas was simply unstoppable in the second section’s six player swiss. Grant Wang and CCFC Director Melvin Patrick shared second place.